I was previously married to a sociopath, and we have a 4-year old son together. I have sole legal and physical custody of our son, but have been fighting to reduce the amount of visitation for quite some time. I recently read that having a forensic psychological analysis done on the entire family would reveal that my ex is a sociopath and possibly prevent him from having ANY visitation going forward. Is this true, in your experience? Do you have any advice for me as I embark on this process? 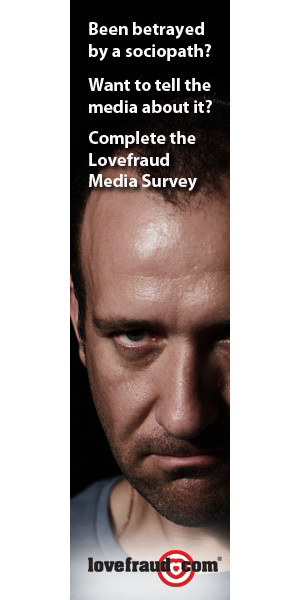 Many, many Lovefraud readers have realized to their horror that they’ve had a child or children with a sociopath. 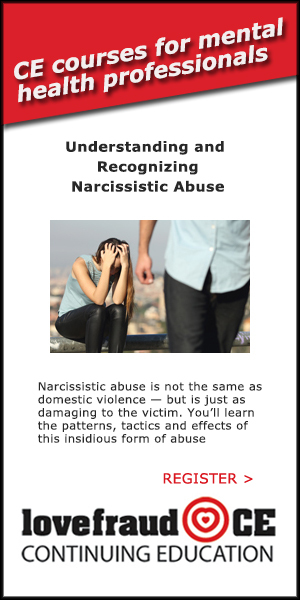 Once you realize that your former partner has a serious personality disorder, and that this person is incapable of feeling love, even for the children, your natural instinct is to want to protect the children from him or her. Figuring out how to do it, however, is incredibly difficult. Following is a list of points to consider whenever you are contemplating legal action regarding your sociopathic partner and children. 1. The sociopath’s objective is to win whatever he or she regards to be winning at the time. It may mean not only winning the court battle, but winning in a way that leaves you crushed, broken and destitute. 2. The sociopath is capable of doing absolutely anything in order to win. This includes lying under oath, accusing you of doing things that you never did, convincing other people to lie (knowingly or unknowingly), falsifying documents, threatening you and the children, and more. 3. Sociopaths often love going to court. For them it’s great drama, an opportunity to be on stage, and they are terrific actors. Sociopaths can break into tears, crying about how much they love and miss the children, even though they totally ignored the kids while you all lived together, or perhaps even abused them. They can discuss your “mental problems” in a voice dripping with concern, even though the only thing wrong with you is him or her. 4. Sociopaths usually pursue child custody for one or both of these reasons: They want to maintain control over you by controlling the kids, or they don’t want to pay you child support. 5. A typical sociopathic strategy is to keep dragging you into court simply to cost you money. The idea is to bleed your finances until you can no longer afford to fight. The 14th Amendment to the U.S. Constitution protects the fundamental liberty interest of natural parents in the care, custody, and management of their children. This protection does not disappear simply because they have not been model parents or have lost custody of a child temporarily. Know that if you’re attempting to keep your partner away from the children, Constitutional Law is not on your side. 7. No provision in the Constitution says children are entitled to loving care, or even safety, from their parents. 8. In Family Court, judges are the kings, and you are a serf. Judges have wide discretion to decide what will happen to you, your kids and your money. Their decisions are law, and other judges are loath to change or reverse any court ruling. 9. Most judges do not understand sociopaths and how they behave (just like everyone else in the world including you before you met your partner). Many judges believe that sociopaths are hardened criminal or murderers. So if you say that your partner is a sociopath, and he or she hasn’t killed anyone, the judge will likely think that you are exaggerating and are simply being vindictive against your former partner. 10. Most judges, like most people, believe that children should have both of their parents, so they often want to keep both parents in the lives of children. 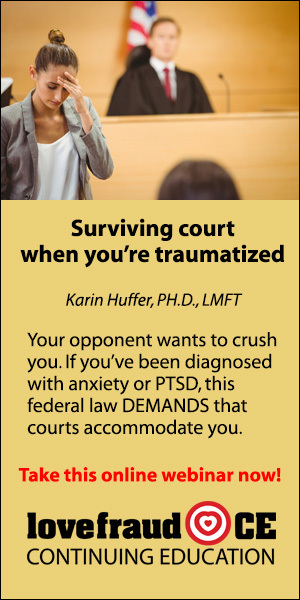 Even if a sociopath has physically abused the spouse, if the children themselves haven’t been injured, and sometimes even if they have been injured, judges may not keep the kids away from the abuser. 12. You can line up all your proof, evidence and psychological reports and a judge can disregard all of it, deciding your case the way he or she wants to. 13. For all of these reasons, who you get as a judge matters a lot. When you know whom your judge is, you should find out everything you can about him or her. They are supposed to be impartial, but that isn’t always the case. Some judges are biased against men. Some are biased against women. Some judges will listen to kids, some will not. This person holds your fate in his or her hands. If you know the judge you will be dealing with, take that into consideration before deciding how to proceed in any matter. 14. Be very, very careful about choosing a lawyer. Some lawyers are dedicated to serving their clients. But some lawyers are only interested in making money. You should shop around and get referrals preferably from someone with a case like yours. If you feel at all uncomfortable with a lawyer, or if you feel that the person does not believe or respect you, do not retain that lawyer. 15. 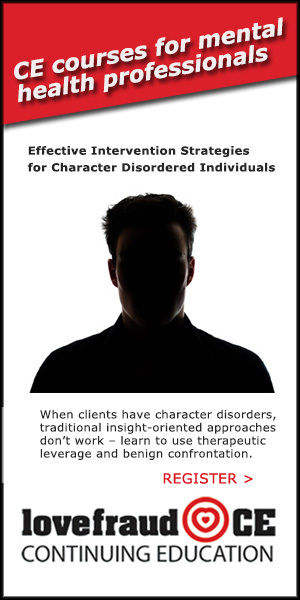 In dealing with a sociopath, lawyers must be up for the challenge. They must understand that the sociopath will stall, delay, fail to produce documents and ignore court orders. Lawyers should never assume that sociopaths are going to do what they’re supposed to do. Sociopaths believe that the rules do not apply to them. 16. Somehow, many sociopaths manage to find sociopathic lawyers. This means not only will the sociopath do anything in order to win, but so will the lawyer. 18. Research shows that whoever pays for a report gets the report that they want. 19. Many psychologists do not understand sociopaths. They do not understand the experience of being targeted by a sociopath. They do not understand how sociopaths affect children. If you are going to retain a psychologist, make sure they get it. 20. Sociopaths are quite capable of manipulating psychologists. Sociopaths can play the victim, talk about loving their children, paint you as the person with problems and some psychologists will swallow it all, hook, line and sinker. For all of these reasons, you need to have your eyes wide open before making any decision about embarking on a court action. You cannot assume that your experience in court will be about doing what is right, discovering the truth or protecting the children. Going to court is always a crapshoot. It may cost you thousands and thousands of dollars, and you may end up with nothing. Therefore, pick your court battles carefully. This makes incredible reading and boy do I wish I knew then what I know now! Our divorce took over two years to complete (two very acrimonious years) and probably around Â£28k on my part even though we didn’t actually have a final hearing. It never made sense to any of us why he would continue to battle on. What I was suggesting was totally fair and resonable. In the end we settled outside of the final hearing. The settlement he agreed to was EXACTLY what the mediator had proposed in Jan 2012 and yet it had taken vast amounts of money and another year and a half to agree to the same. I couldn’t bellieve it when after that he came to clear some belongings from the house and I overheard him boasting to his friend about the outcome. “you had a right result there then didn’t you?” his friend said, and he was full of himself. But truth is, he ended up with less because he himself had a 17k legal bill. He had lied non stop throughout, forcified papers, ignored court orders, even had friends produce letters about loans which were not true. Throughout the whole two years (and still) he ignored the children, even though living under the same roof for most of the time and yet in his narrative he harped on about how he needed a 3 bedroom house, the same as me, to house them. It beggars belief but it is all true. Hi – i have just read your email and am so shocked at how close your story is to mine !! I am now years past our divorce – but like you it cost a small fortune and we ended up with what the judge would have decided in the first place. We went to magistrates court over domestic violence – he had been violent to one of my children too ( he had a caution for that) and this was taken into account. The court case took 2 days and he just stole the show ! I was so bruised afterward – more so that the beating I had got. I had records from the doctor, the police and photographs – but he still got acquitted. I used to think he was aspergers and to some extent still wonder if that was his problem rather than a sociopath, and I still try and read up to work out which one he was. I am not sure why I am so interested, perhaps its just my mind needing to make sense of it all. He bought himself a ‘people carrier’ in the belief that he would be taking all three of our children and his girlfriends child out. Sociopaths will do ANYTHING they deem necessary to get what they want. They will even hurt themselves just to say that you did it. If you are in a relationship with one, cut your losses and run, hard and fast. I wish I had. phillip, that all sounds familiar. Mine put a protection order on me years ago, I came back a week later (before knowing she had one on me hadn’t been served) brought two cops and she refused to let me get the rest of my stuff even with the cops pleading with her to just let me get them. This last bout we had a month ago,,she came after me 3 times before I got out of the house (no hitting, just grabbing, scratching/pushing, and a kick) then emailed me saying I left bruises up and down her arms and the only reason she scratched me was cause she was trying to get me off of her, all I did was push her off me once, and the other two times I just held her still so she couldn’t do anything until she calmed down. Now im getting the silent treatment as she expects me to “fess up” and apologize and come crawling back begging to come home (I stupidly did this a few times in the past) it only empowers her to escalate the behavior as she knows I wont leave. 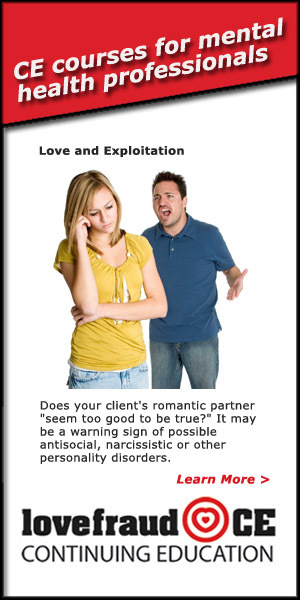 After spending four years with a sociopath,I am torn between testifying against her. While she was with me, she tried to poison her then husband three times, first, she tried to load him up with caffeine to give him a heart attack, that didn’t work, then she bought 200 oxycontin 80mg off of the internet, and crushed them up and loaded his food up with them. She turned him into a drug addict and divorced him because he was a drug addict. She got 3000 a month in support and made him go to rehab. She was telling me this on the phone and I felt like I was in a nightmare. She would say ‘ I hope it was enough this time to make him od”.I asked her ‘what are you going to do if he dies?” her response..’I will have him cremated and flush his ashes down the toilet’. WOW, this is a good guy who gave her 22 years and 4 children, and a dream life. I always wondered when she would do it to me..well, it took 4 years until I was him. Your response to this woman’s question was excellent. Over and over, I have seen children taken from their loving mothers and given to fathers who are on the record pedophiles and abusers. Why? Money. Our courts are now corrupt and justice doesn’t exist. The good old boy network is alive and well, too, where police and officials love to “put a woman in her place.” Then there are the women who want to gain favor with men by hurting a woman, too. There is an organization in Minnesota working to take family issues out of the courts. It’s called Family Innocence. You can find it on the web. This really is incredible reading and good advice. I got my divorce almost 6 years ago and can only say that when it comes to lawyers, be very careful. The soon-to-be-ex will likely seek out a shady attorney, a pit-bull, someone similar to his/her personality. Divorce and custody issues are much worse in today’s court systems. You’ll probably benefit from researching for your own attorney and seeking out several recommendations, then consulting for some time with the attorney before you commit to one. I believe many lack a grip on what sociopathy is unless they had to live with one, too. Same applies to many healthcare providers such as psychologists. Keep looking until you find someone who fights for you as divorce is a horrible process to encounter in court these days. 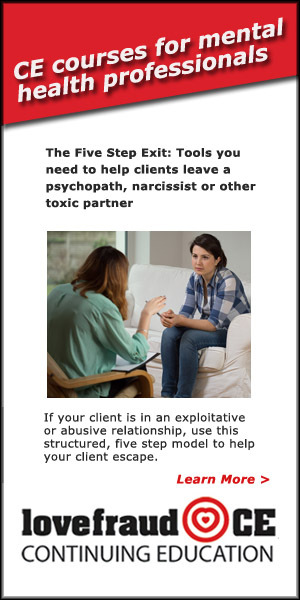 Yes – be sure to find an attorney who (if s/he doesn’t understand what a sociopath is) is empathic to you, patient, detail oriented, and aggressive. I’ve worked with my attorney for twelve years so far, in the aftermath of my divorce. There were no custody issues because my ex quickly abandoned our children after he had done the same to me. (I was lucky in that way!) I’ve been working all these years with my attorney to collect child support and school tuition payment which my ex had agreed to in our divorce settlement. Yes, it has been costly, but the alternative – not to fight for my kids, would have dogged me all my life. At least I know that I’ve fought the best way I can. My attorney and I work as a tag team. I have learned to keep precise records, I have learned to keep my cool, I have learned how to wait, I have learned to not let my ex’s sociopathic attorney bully or intimidate me, which she does through threatening letters. She’s also threatened my attorney with “sanctions”. It’s a perpetual game of seeing who will blink first. I have learned to stay cheerful despite their nonsense. I have learned that I have to release feelings of anger and fear and not live in the past. It’s been character building. I have to frame it positively. 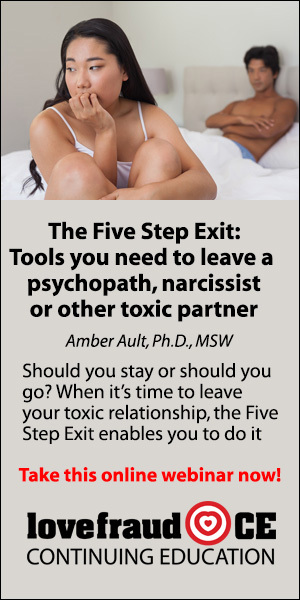 Mostly, I’m hugely grateful that my ex and his toxic wife are not in our everyday lives. Advice to anybody going through the legal process: Stay positive. Try to glean the benefits from any part of the odious process. Being positive is the best revenge. Good luck and stay with it! And at night, jot a list of the character assets that you are developing. That way you’ll “win” no matter what any court or dysfunctional system produces or doesn’t produce. Firebird – very, very sound advice. I have learned so much during the last 3.5 years. Firstly I slowly and painfully discovered the truth about my ex – it was an horrendous experience and Kim, I to, wished many times that I could have been more discerning and even then, blamed myself (well old habits die hard!) but I no longer think its about being discerning. Its about being hood-winked. I was with my ex over 25 years, married for 23 and yet for most of that he had totally fooled me. It was only really in the last 10 years that I started to see real cracks but the truth didn’t really reveal itself until the last three. Luckily for me there was never a question of custody as my children as they were 15 and 16 when this started. He had assualted my son – not seriously enough for the police to do anything it seems but none the less the kids were old enough to make their own decisions and since my daughter witnessed it, neither would chose to live with him. He knew that and never even tried. He had pretty much washed his hands of them anyway when he started having an affair, it was the first glimpse of something wrong. However, even though he knew that and wasn’t speaking to them (literally), when it came to court he would claim our living needs were the same as they would be staying with him. In fact, he went one better and claimed that he needed a larger percentage of the pot to enable him to buy a 3 bedroom house outright with no mortgage because he had no ability to get a mortgage and I could get an 80k mortgage which would enable me to buy a 3 bedroom house! He later also tried to suggest that he may have to claim maintenance off of me because he had to give up his career as a builder due to injury. (This of course was rubbish. He was and still is earning money as a builder and also a personal trainer and teacher of martial arts!) Lies, lies and more lies. It shocked me again and again, this man that I had thought – if nothing else to me anymore – had been an honest man. As far as I know, he’d never been in trouble with the law and had decent morals! From my own experience and everything I have read on this site so far I would absolutely reiterate what Donna has said above regarding sociopaths and court! I remember one of my worst moments was a few days before our final hearing was due and I had a conference call with my solicitor and barrister who was basically saying he didn’t think we had much chance of getting what I felt was fair because of my exes ‘financial situation’ – and I said “but he’s lying, we all know he’s lying, surely any judge will see that.” and he said “I have no doubt that I can show he’s a liar within 10 minutes of being in the court room but it doesn’t change anything.” I was stunned! It was like I’d been hit by a truck and dragged down the road. I felt finished in that moment, totally broken. Thankfully, I got over that hump like I have all the others. You learn, you get stronger. I totally agree with what firebird has said. Moving on, moving forward, remaining strong and positive is absolutely the only way you can ‘win’ and if its what you’re after, I don’t think there could be a worse revenge! Unfortunately there are too many armchair psychologists out there, even those with degrees! 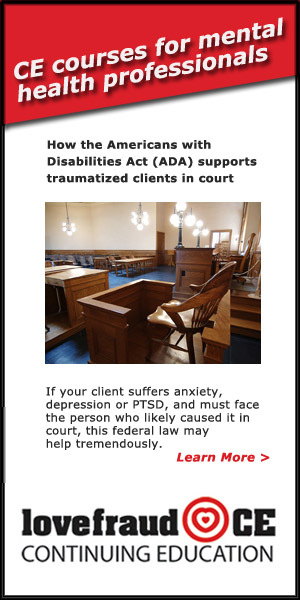 If you’re emotional in court or stressed out and your lawyer doesn’t “get it”, he or she may think you are the one with the problem. My experience has been that the healthier person will submit to psychological testing and the one who will not submit has something to hide. This however is not necessarily a good thing as even if you are diagnosed with depression and anxiety which are common for someone whose been under duress, those test results can be used against you in court. 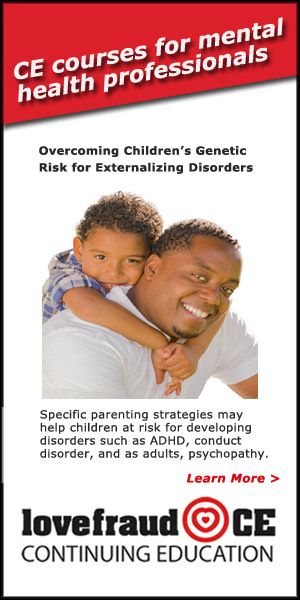 Also, even if you order a custody evaluation psychological testing may not be done! How the hell can you determine if someone is mentally fit to parent without extensive, objective testing? Knowing that psychology is a soft science, a psychologist has to use all tools available to do their job competently and it really takes time to talk to and evaluate people as we can be very complicated. Thank you all for sharing your experiences! 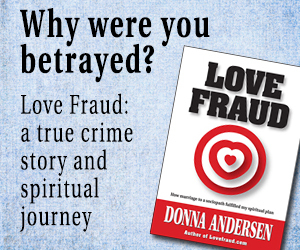 It is beneficial to all Lovefraud readers who are in similar situations. whoops sry, i pushed on wrong button and accidentally reported ur comment, donna! anyway i am looking for help in how to proceed in social security for the kids. their spath-dad is going to be getting SSI or SSD or something soon and they can get money too. he pays me nothing so it wud be awesome to get this. HOWEVER he wants their SS#s. There is no way he can have that info. He was dumb enough to leave without trying to get it–cud have looked in the file cabinet but that wud have required forethot and effort, neither of which he is good at. His loss. If he gets the SS#s, he will sell their identities, use it himself to get utlities on, etc. Is there somehow Soc Sec can keep it from him? Does anyone have any experience with this? It is a good idea for everyone to save or print this article and read it if you ever find yourself contemplating filing a lawsuit, or if someone threatens you with litigation. Donna’s descriptions are very accurate and her advice valuable. Trust me, I’ve lived it. 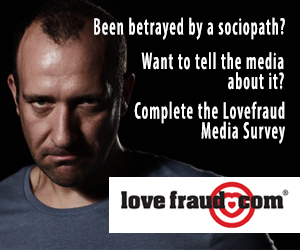 I have read reports from a forensic psychiatrist that was duped by a sociopath. It was horrible. I’m not sure how you can ‘vet’ them before hand but it may be worthwhile. I noted that he seemed to feel the need to find something of what the creep said to be credible and have seen that before. The psychopath then kept the doctor on that path, the doctor even took him as a client for counselling – horrible conflict of interest. In Canada if you make a settlement offer that is more than what was awarded by a judge there are penalties, I believe it was double the costs. Not sure if that included lawyers fees. My ex spouse had a court ordered forensic psychological evaluation which declared him to have antisocial personality disorder, to be violent and to have alcohol/drug abuse issues. At the time, I had temporary custody and he had supervised visitation. Visitation was advanced despite the evaluation findings. He abused our children during unsupervised visitation on more than 1 occasion, both physically and sexually. Children services became involved finding that the abuse had occurred, but the agency had to defer to Domestic Relations court to handle it because we had an open case pending(the divorce). The magistrate went against childrens services’ findings and recommendations as well as the court appointed attorney guardian ad litem’s recommendations, placing my 3 children in the custody of their abusive, sociopath father. During the children’s service investigation I was advised by the police and social worker not to send the kids back to the unsupervised visitation. I didn’t and my attorney filed for a modification of visitation due to a change in circumstances. My ex counter filed for emergency temporary custody. When we got to court the magistrate believed his claims of parental alienation, I made the kids lie on him and “fooled” children’s services. He was given temporary custody and I was told to “get help for my problems”. The chief magistrate who heard the final divorce hearing upheld the interim magistrate’s decision in the divorce decree granting my ex sociopath custody of the children stating “the father is most likely to honor the visitation schedule”. No consideration of the psych eval, his history of domestic abuse, child abuse, drug abuse, violation of the restraint order, etc… He cried, lied, has a sociopath lawyer, paid off a few people, did whatever it took to “win”. Our kids lose. He is currently attempting to limit my visitation and cause me to go to jail,claiming I’m in contempt of any order in the divorce decree he can. He has taken me to court 4 times in the 1 year since our divorce has been finalized. The advice given by Donna is priceless. If you continue to attempt to limit and/or eliminate visitation, you may lose what you already have, custody of your child. The sociopath will use your love and commitment to your child’s health, safety and well being against you, convincing the court that he is the “victim” of you and you need help. Nothing is guaranteed when dealing with the court system. You can have the best attorney, present the best evidence, and have the purest intentions and it doesn’t guarantee the desired result, especially when dealing with a sociopath. I have found that court officials in any capacity/function are predominately ignorant of the behaviors, effects and impact of sociopathy on them or anyone else. It is highly unlikely that any court will eliminate the visitations, even with a forensic psych eval. If you decide to proceed, be VERY cautious. this is my reoccurring question…did u think u wud win, cudnt believe ur life wud turn into a Lifetime channel horror story and thats why u never took off with the kids to protect them from the abuser? I am a firm believer that Truth is stranger than fiction. Ppl wud never believe the stuff if we wrote it. Theyd say it cudnt happen. if i smelled him getting anything less than (MY pick in supervisor 2 of) supervised visitation only, i wud run. Instantly. he wants 2 hrs a week to play with kids while being heavily monitored, ok. the kids will want to end that, BORing b4 too long…i hope. they have no relationship with him lol but even if they didnt — its fairly safe if someone is there to stop him from ANY pumping or priming or disordered conduct while hes in their world. HE wud get sick of it real fast as he cant operate without dysfunction and wud not know wat to do for 2 whole hrs at a time where he had to interact with them and correctly at that, its beyond his capability. i know that sounds like a movie too to go off the radar and cant work out in real life. but ppl do it. I Wud Do It. my kids are not getting abused any more than they did. not being able to live a normal life is stopping someone from fleeing with their precious children? they wont have a normal life with the spath!! heaven help all the children being court-ordered to undergo FURTHER CRIMINAL ABUSE. mine will not be subjected to that, ever. it will be over my very dead and rotting corpse. heaven help all the grieving parents who realize too late, the courts are very human, therefore fallible and often do FAIL and the sane parent shud have acted b4 it was too late. god bless their grieving hearts and souls. I totally understand your nightmare. I proved my SP was abusive the children and I and because I have no family in town, he was found to be the more fit parent due to his family support system. I lost my home,my children and was not given so much as the chance to enter the home to get my belongings. I did not have money for attorneys so I went alone to my own trial standing against tons of his witnesses. Eventually after my 8 year old threatened suicide, I ran with the kids. Not smart. Then I had no rights to the kids. Less than a year later he gave me the kids with the agreement I continued to pay support of 900 a month. It was my honor. My children are grown and he walked out of their lives for 10 years and now since they are grown, wants to be buddy/buddy. My kids see through him. My point is never stop fighting. Never. Your story sounds so bad it’s almost hard to believe, but knowing how psychopaths operate, it it not unbelievable at all. His behavior is very familiar. Your story makes me wish I could be your advocate and be there with you for every appointment/hearing in your case. This is truly an outrage. Stand your ground and don’t give up. Justice takes a long, long time. Some day he will make a mistake that will bring your kids home to you. I can only say how sorry I am to hear the outcome of your divorce and custody proceedings. It is a travesty. It breaks my heart to hear what you have all been through- and what your children will continue to endure. I can say you sound really clear about your situation. I wish you strength, healing, courage, and patience in great abundance. 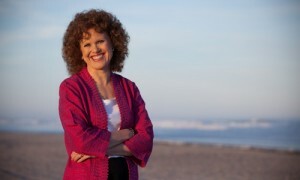 Another site to visit, that addresses family court and child’s rights is Cappucinoqueen.com. I visit the site. The woman who blogs there is very insightful and resilient. An inspiration. But a caution: her story has the worst possible ending. It could be upsetting to a parent who has lost custody. I was reading all the latest posts on here on the train commuting to work this morning and I could literally feel the blood draining from my body. I must have turned white as my daughter asked if I was OK? I feel so, so sorry for the victims here – because they are genuine VICTIMS! The stories are horrendous! Reading these posts though has again made me realise just how lucky I am to finally be out of this. I won’t really feel 100% free and safe until the house is sold and we move to a new and fresh start and my ex has no forwarding address or key but even now our quality of life is so much better. The children are getting there and I have a new and lovely man in my life. So many times during the past few years I felt regret that I hadn’t acted sooner. The most poinient moments were early 2011 when both children, in totally separate conversations said to me that they would “rather dad left”, they couldn’t “stand him in the house”, they were “fed up of his selfishness”, and “were sick of us all having to walk on eggshells when he was around.” In the conversation with my daughter in a cafe, I had to leave the table and run to the toilet as I was so upset. It shook me. I was upset because for years I had felt I was staying with him for them. To enable them to have a good solid foundation, a proper family but hadn’t realised they didn’t want that anymore, that it was in fact harming them. However, seeing my ex’s ludicrous and at times totally illogical behaviour throughout the duration of our divroce, during court appearances, etc, I know for absolute certainty that if I had tried to divorce him when the chidren were younger, I would have had the same fight on my hands as above. I am very grateful now that I waited, however painful it was, as I believe the outcome would have been so much worse. Remember – the “law” is not the same as “justice”. The law involves human beings (some of whom will also be psychopaths). Many lawyers are prepared to pull out “all stops” to win – even when they know their client is at fault – or even dangerous. Human beings are liable to make mistakes, have prejudices, be out to gain a “reputation” – and be fallible. Be prepared to lose money, time, health, reputation, and peace of mind. So true, Bobbie, about all that you will lose when involved in a lawsuit. Some may wonder about the loss of health, as in how that can happen. Think about an ongoing lawsuit for a significant amount of time and what the stress can do to a person’s health. High blood pressure from being repeatedly lied about and the frustrations of the “attorney games” is one example. Also the stress of worrying about getting a corrupt judge, which is an unfortunate possibility. When you hear the saying that the only winners are the attorneys, believe it, it is so unfortunately true. The judicial system is truly broken. You’re right Bobbie. I’m lucky in the sense that I think my ex’ solicitor was actually a very decent guy just doing a job. I believe after our appearance at a ‘negociaiton’ hearing where we spent 8 hours in the lobby waiting to see the judge during which time my ex flatly refused to budge from an insane proposal – his solicitor and barrister saw him in a rather different light. By the time we finally had our slot, my ex had made his excuses and left. I believe (but will never know of course) that his team had told him the judge would tell him to stop being stupid and wasting everyone’s time and he does not like being told he’s wrong, not by anyone. He has a short fuse and he knows it,so he went and left instruction with his barrister. Beyond that point I noticed that his solicitors letters were ‘lazy’, sometimes poorly written as if just quoting my ex and he allowed my ex to put a lot of rubbish in his narrative that I’s positive my solicitor would have advised me to remove. I am in the midst of divorce proceedings. Divorce is always difficult, divorcing a sociopath/narcissist is like going to war. You will lose if you don’t bring the best weapons you have. Luckily we are “only” fighting over property and spousal support, no minor children. But they are so good at manipulating. He wants to portray me as an “insane”woman and of course he is the “poor” victim. So far I must admit that all these little games do not work in court so easily. My attorney keeps everything under “control” and I feel very protected from my soon to be ex’s insults. Of course the no contact is very helpful with this. In court I don’t look at him. For me he does not exist anymore. My advise is to never try to fight him on your own. There is legal help out there. Sell your material possessions, borrow money, do whatever it takes. For me obtaining a very competent, strong male attorney was a good decision. My husband cannot walk all over me and put me down. Like he used to for the past 20 years. Of course I do not know the outcome of this divorce. But I have faith and hope that justice will be served. No one really wins a divorce. But be prepared for the fight of your life. I am remaining strong and confident with the help of my attorney and my friends. My husband can run to his little mistress/co worker and cry to her. Because I don’t care about them anymore. This is a business deal about money now, no more emotions for me. Judges and courts DO NOT RECOGNIZE SOCIOPATHS, especially mothers that are sociopaths! My husband and I are not rich, and over the last 8 years spent $75,000.00 on lawyers just to keep what we have that was never theirs as a couple. His children don’t speak to him and child support is for 21 yrs! (just changed to 19 this past July)His ex is a seasoned sociopath and has alienated his children from him since they were born. They are now 18 and almost 23 and have nothing to do with him. Our lives will not be at peace until 11 months from now when the 18 yr old is emancipated and we no longer have financial ties to her “mother”!We have never had a vacation, we live very modestly, and we have spent 75K just defending ourselves and keeping her lawyers from taking the shirts off our backs. There is no winning in court with a sociopath, rarely a judge will see thru them..I haven’t seen it happen yet? The act they can put on is a well planned, professional trail of deceipt and lies making them the true VICTIMS! Sociopaths thrive on drama and taking them to court is dramatic….they love to show off for the court and their lawyer….they are on stage performing and winning! Keep a low profile, hold your emotions, no matter how hard it becomes…take a deep breathe! Lawyers are all in it for the money, they are bottom feeders! If you tell them that they will be dealing with a sociopath they just think you are a bitter ex. We have had 5 lawyers and all of them have made grave mistakes that have cost us hundreds of thousands of dollars…and we had to pay them for the mistakes on top of it! No one wins…….no one! Thanks for the advice for court proceedings. Yes, I do keep a low profile, keep my emotions under control and just stay calm. Nothing can be worth than living this nightmare for 20 years. Of course my soon to be ex loves the drama. Especially because he is a cop and believed that he gets “favoritism” from the legal system. He put an injunction against me just to annoy me. He conveniently asked for it in the county where he is a cop. I have never set foot in this county. My attorney was outraged at his fabricated lies and accusations. The judge dismissed it and it was dropped. He thought he would look more like the victim if he says that he is afraid of me. So this plan did not work out. Instead he looked like a complete loser in open court. I am prepared for anything because he is pure evil . Therapists can also be psychopaths, so beware. After a 12 year absence from a deadbeat father who didn’t even send a birthday card to my son, let alone child support, my son began to work with a therapist at college. I had hoped he would help my son stay on track at school. Brandon had been through special schooling previously that provided supports. So I thought having a therapist would enable him to transition better than leaving him to his own devices during his first time on his own. After a few weeks, my son told me that he and the doctor thought it would be a good idea for him to reach out to his father. Although the man had kidnapped his two other boys by a previous marriage, my son was now old enough and big enough to prevent that from happening. I got in touch with my ex-in-laws, and several weeks later, my son heard from his father. The downward spiral of our relationship was intense. He found out that his father was extraordinarily wealthy, through association with an heiress. His father could do things for him that I couldn’t even dream about. By accidental discovery I learned that the therapist had been excommunicated by his own children, had made his life’s work teaching fathers how to claim “parental alienation syndrome” against their ex-wives, and convinced my son that I’d driven his father out of his life. Our relationship ended with this comment….. “Now that I’m independent, what do I need you for?” The heartbreak of losing my son is what drove me to write my book, “Carnal Abuse by Deceit”, which many of you may have read or heard about on this blog. If you’re raising the children of a disordered parent, I believe it could help you with their development. Today, we have a great deal more transparency in researching the credentials of doctors and other practitioners. It’s so important to get as much background as possible. They have a tremendous impact on the people in their care. What I’ve learned about the decisions that you make, or the ones that are made for or in spite of you regarding your children….. all you can do is the best that you can do. The rest is in God’s hands. Wishing all of you with children the best possible outcome. If I have one suggestion, it’s to shower them with as much loving kindness, hugs and affection as you can, while you can. Knowing it’s in God’s Hands, I still have to do as much as I am able to do. I don’t sit around and wring my hands, I am pro-active. If I’m hungry, I look for work and Do ANY Work I find. If I’m cold, I take ANYthing I can get to cover myself. If I need shelter, I do what it takes to get that too. Within ethics, of course. I don’t rob a bank or prostitute myself for my needs. Or my kids’ needs. It’s not knowing if I’ve done all I CAN that’s nerve-wracking. Or *knowing* I did not. Then regretting that. Some regrets have horrific implications. Dismemberment, disordered brains or death can even result. I have to cling close to Him, hold His Hand tightly. And never let go. Or I’ll never know for sure. And that can drive you insane. IDC if the spath or NPD/BPD wins. Let ’em win. In the real world, they have lost. –lost their soul. And their peace. I am responsible for only that which I am responsible for. Children are it; possessions and lifestyle are meaningless without peace. They’re pretty poor companions even in the best of times. And children grow up. It’s a matter of a few decades at most. His Word never returns void. You are an instrument of God in your children’s lives. Knowing that you are doing what you feel is best is the only way you’ll have peace with the outcome, even if that outcome looks different than you thought it would.